Socializing a puppy simply means teaching your dog to get along with other dogs, pets, strangers, and basically the rest of the world. Puppy socializing works best in the early and formative weeks of a puppy’s life. And if you do socialize your puppy while he is still young, the lessons will be painless. And your new puppy will have an easy time adjusting to his new environment. When socializing a puppy, you need to consider some factors such as his breed and what your puppy experienced at the breeder’s or the rescue organization. 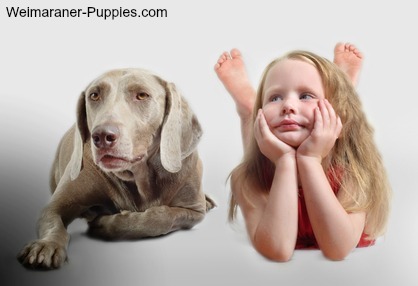 Weimaraner puppies are shy by nature, and, with appropriate dog training, they can get along with children. to get along with children and other pets in your home. 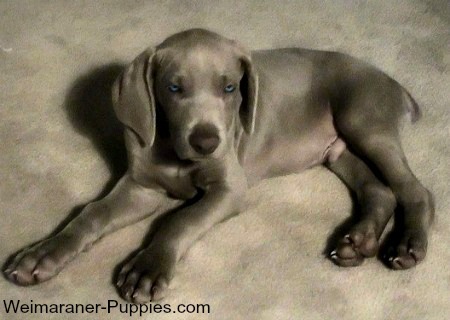 Weimaraners are often reserved with strangers, and they are very protective of their family (pack) and home territory. To avoid problems with guests coming into your home, you need to teach your Weim that there are many people who are friends—friends are OK. In addition, Weimaraners can be aggressive toward other dogs (and cats, in particular). Bred as hunting dogs, they do their job well. 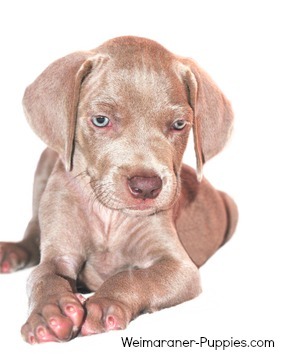 And, often you will find that your Weimaraner will consider small dogs, cats, birds or pet rodents—as his prey! If you have other small dogs or a cat, you would be wise to eliminate the temptation for your Weimaraner puppy to “hunt” in your home. 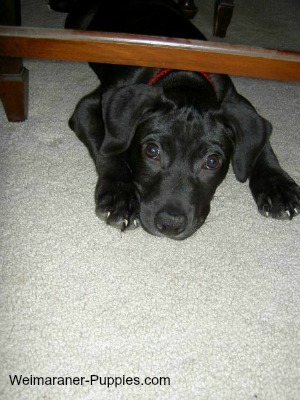 Begin socializing a puppy when she is quite young, usually between 8 and 16 weeks old. During this period, your dog is still in the developmental stage physically and mentally. So it wouldn’t be too hard to teach him social skills at this age. Start socializing your puppy by taking him to meet people and other dogs. Training sessions should be brief and you should meet only one dog or one person at a time. This will avoid over-stimulating and confusing your puppy. Praise your dog frequently to reinforce his good behavior. Social sessions should be positive and fun. Have each person approach your dog gently and speak softly. Let your dog determine when she is ready for more interaction. Your purpose is very simple–to help your dog get used to being with people outside your family. If you have a rescue dog, it will require a lot of effort and patience on your part when socializing your puppy or dog. You’ll need to consider who the previous owners were, and how he was treated. If your Weimaraner was previously abused, he may be fearful or aggressive when introduced to new people and activities. If, after working with your Weimaraner for awhile, she still is either aggressive or overly submissive, consider using something to calm her down before meeting new people or dogs. Many people have found that a Thundershirt Dog Jacket will calm their dog in situations like thunderstorms, meeting new people, being left alone or encountering other dogs. A Thundershirt is a special shirt or jacket that provides gentle pressure that calms a dog. As simple as it sounds, they do work! Socializing a puppy will make life easier for both of you. Your dog will be comfortable meeting strangers when you are out together. Weimaraners need to know that it’s OK to meet new people and dogs. 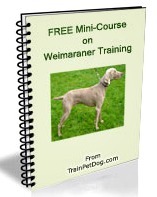 Your Weim will learn how to act around children and older people. You will be able to entertain guests and know that your dog is comfortable—and your guests won’t be attacked. You will be able to take enjoyable walks together, knowing that your dog won’t become a problem because he is protecting you—or hunting the neighbor’s cat. Make socializing a puppy fun. As with other dog training activities, socialization should be fun for both you and your dog. Taking simple measures to help your dog feel comfortable around people and other dogs, will help him learn good behavior—and make your life easier, as well! If you would like a little help to learn how to go about socializing your new puppy, you can access quite a few Doggy Dan videos for 3 days for just $1. There is no obligation to continue, and it’s easy to opt out later, if you choose to do that.